USES: This medication is used alone or with other medications to control seizures. Controlling and reducing seizures lets you do more of your normal daily activities, reduces your risk of harm when you lose consciousness, and lessens your risk for a possibly life-threatening condition of frequent, repeated seizures. 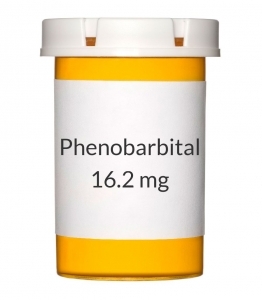 Phenobarbital belongs to a class of drugs known as barbiturate anticonvulsants/hypnotics. It works by controlling the abnormal electrical activity in the brain that occurs during a seizure. This medication is also used for a short time (usually no more than 2 weeks) to help calm you or help you sleep during periods of anxiety. It works by affecting certain parts of the brain to cause calming. HOW TO USE: Take this medication by mouth with or without food, usually once daily at bedtime for seizure control, or as directed by your doctor. Take with food or milk if stomach upset occurs. If you are using the liquid form of this medication, measure the dose carefully using a special measuring device/cup. Do not use a household spoon because you may not get the correct dose. Dosage is based on your medical condition, phenobarbital blood levels, and response to treatment. The dosage in children may also be based on weight. Your doctor may direct you to start this medication at a low dose and gradually increase your dose to prevent side effects such as drowsiness and dizziness. Follow your doctor's instructions carefully. Do not take more or less of this drug than prescribed. It may take several weeks to reach the best dose for you and completely control your seizures. This medication works best when the amount of drug in your body is kept at a constant level. Therefore, take it at the same time(s) each day. Do not stop taking this medication (and other anticonvulsant medications) without consulting your doctor. Your seizures may worsen or cause a very severe seizure that is difficult to treat (status epilepticus) when this drug is suddenly stopped. This medication may cause withdrawal reactions, especially if it has been used regularly for a long time or in high doses. In such cases, withdrawal symptoms (such as anxiety, hallucinations, twitching, trouble sleeping) may occur if you suddenly stop using this medication. Withdrawal from phenobarbital can be severe and include seizures and (rarely) death. To prevent withdrawal reactions, your doctor may reduce your dose gradually. Consult your doctor or pharmacist for more details, and report any withdrawal reactions immediately. Along with its benefits, this medication may rarely cause abnormal drug-seeking behavior (addiction). This risk may be increased if you have abused alcohol or drugs in the past. Take this medication exactly as prescribed to lessen the risk of addiction. When this medication is used for a long time for anxiety or to help you sleep, it may not work as well. Phenobarbital should only be used for a short time for anxiety or sleep. Talk with your doctor if this medication stops working well. Tell your doctor if your anxiety or seizure control worsens (such as the number of seizures increases). SIDE EFFECTS: Dizziness, drowsiness, excitation, headache, tiredness, loss of appetite, nausea, or vomiting may occur as your body adjusts to the medication. If any of these effects persist or worsen, notify your doctor or pharmacist promptly. Remember that your doctor has prescribed this medication because he or she has judged that the benefit to you is greater than the risk of side effects. Many people using this medication do not have serious side effects. Tell your doctor immediately if any of these unlikely but serious side effects occur: staggering walk/clumsiness, double vision. A small number of people who take anticonvulsants for any condition (such as seizure, bipolar disorder, pain) may experience depression, suicidal thoughts/attempts, or other mental/mood problems. Tell your doctor immediately if you or your family/caregiver notice any unusual/sudden changes in your mood, thoughts, or behavior including signs of depression, suicidal thoughts/attempts, thoughts about harming yourself. Tell your doctor immediately if any of these rare but very serious side effects occur: fast/slow/shallow breathing, fainting, slow heartbeat, severe tiredness/weakness, pale skin. A very serious allergic reaction to this drug is rare. However, seek immediate medical attention if you notice any symptoms of a serious allergic reaction, including: rash, itching/swelling (especially of the face/tongue/throat), severe dizziness, trouble breathing. This is not a complete list of possible side effects. If you notice other effects not listed above, contact your doctor or pharmacist. In the US - Call your doctor for medical advice about side effects. You may report side effects to FDA at 1-800-FDA-1088. In Canada - Call your doctor for medical advice about side effects. You may report side effects to Health Canada at 1-866-234-2345. PRECAUTIONS: Before taking phenobarbital, tell your doctor or pharmacist if you are allergic to it; or to other barbiturates (such as primidone, secobarbital); or if you have any other allergies. This product may contain inactive ingredients, which can cause allergic reactions or other problems. Talk to your pharmacist for more details. Before using this medication, tell your doctor or pharmacist your medical history, especially of: certain hormone problems (adrenal disease such as Addison's disease), liver problems, kidney problems, lung disease (such as sleep apnea, chronic obstructive pulmonary disease-COPD), mental/mood disorders (such as depression, thoughts of suicide), history of alcohol/substance abuse, personal/family history of a certain blood disorder (porphyria), certain vitamin deficiencies (folic acid, vitamin K). This drug may make you dizzy or drowsy. Do not drive, use machinery, or do any activity that requires alertness until you are sure you can perform such activities safely. Avoid alcoholic beverages. The liquid form of this product may contain alcohol or sugar. Caution is advised if you have diabetes, alcohol dependence, liver disease, or any other condition that requires you to limit/avoid these substances in your diet. Ask your doctor or pharmacist about using this product safely. Before having surgery, tell your doctor or dentist about all the products you use (including prescription drugs, nonprescription drugs, and herbal products). Older adults may be more sensitive to the effects of this drug, especially drowsiness and dizziness. However, this drug can often cause excitement or confusion instead of drowsiness in older adults. Children may be more sensitive to the side effects of the drug. This drug can often cause excitement instead of drowsiness in young children. This medication is not recommended for use during pregnancy. It may harm an unborn baby. However, since untreated seizures are a serious condition that can harm both a pregnant woman and her unborn baby, do not stop taking this medication unless directed by your doctor. If you are planning pregnancy, become pregnant, or think you may be pregnant, immediately talk to your doctor about the benefits and risks of using this medication during pregnancy. Since birth control pills, patches, implants, and injections may not work if taken with this medication (see also Drug Interactions section), discuss reliable forms of birth control with your doctor. This medication may lower your folic acid and vitamin K levels, increasing the risk of spinal cord defects. Therefore, check with your doctor to make sure you are taking enough folic acid and vitamin K. Infants born to mothers who have been using this medication during pregnancy may also have symptoms such as fussiness, shaking, or bleeding. Tell the doctor immediately if you notice any of these symptoms in your newborn. This medication passes into breast milk and may cause excessive sleepiness or feeding problems in the nursing infant. Consult your doctor before breast-feeding. DRUG INTERACTIONS: The effects of some drugs can change if you take other drugs or herbal products at the same time. This can increase your risk for serious side effects or may cause your medications not to work correctly. These drug interactions are possible, but do not always occur. Your doctor or pharmacist can often prevent or manage interactions by changing how you use your medications or by close monitoring. To help your doctor and pharmacist give you the best care, be sure to tell your doctor and pharmacist about all the products you use (including prescription drugs, nonprescription drugs, and herbal products) before starting treatment with this product. While using this product, do not start, stop, or change the dosage of any other medicines you are using without your doctor's approval. Some products that may interact with this drug include: etravirine, felbamate, rilpivirine, MAO inhibitors (isocarboxazid, linezolid, methylene blue, moclobemide, phenelzine, procarbazine, rasagiline, selegiline, tranylcypromine), phenothiazines (such as chlorpromazine, prochlorperazine). Other medications can affect the removal of phenobarbital from your body, which may affect how phenobarbital works. Examples include disulfiram, phenytoin, valproic acid, St. John's wort, among others. This medication can speed up the removal of other medications from your body, which may affect how they work. Examples of affected drugs include cyclosporine, doxycycline, estrogens, griseofulvin, metronidazole, ranolazine, "blood thinners" such as warfarin, corticosteroids such as prednisone, calcium channel blockers such as felodipine/nimodipine, among others. This medication may decrease the effectiveness of hormonal birth control such as pills, patch, or ring. This could cause pregnancy. Discuss with your doctor or pharmacist if you should use additional reliable birth control methods while using this medication. Also tell your doctor if you have any new spotting or breakthrough bleeding, because these may be signs that your birth control is not working well. The risk of serious side effects (such as slow/shallow breathing, severe drowsiness/dizziness) may be increased if this medication is taken with other products that may also affect breathing or cause drowsiness. Therefore, tell your doctor or pharmacist if you are taking other products that cause drowsiness including alcohol, antihistamines (such as cetirizine, diphenhydramine), tricyclic antidepressants (such as amitriptyline), drugs for sleep or anxiety (such as alprazolam, diazepam, zolpidem), muscle relaxants, and narcotic pain relievers (such as codeine). Check the labels on all your medicines (such as allergy or cough-and-cold products) because they may contain ingredients that cause drowsiness. Ask your pharmacist about using those products safely. This document does not contain all possible interactions. Therefore, before using this product, tell your doctor or pharmacist of all the products you use. Keep a list of all your medications with you, and share the list with your doctor and pharmacist. OVERDOSE: If overdose is suspected, contact a poison control center or emergency room immediately. US residents can call the US National Poison Hotline at 1-800-222-1222. Canada residents can call a provincial poison control center. Symptoms of overdose may include: severe tiredness/dizziness, inability to wake up, very slow breathing rate. NOTES: Do not share this medication with others. It is against the law. Keep all medical appointments so that your doctor can monitor your progress or check for side effects. For long-term use, laboratory and/or medical tests (such as phenobarbital blood levels, blood counts, liver/kidney tests) should be performed periodically to monitor your progress or check for side effects. Consult your doctor for more details. MISSED DOSE: If you are taking this medication to prevent seizures and miss a dose, take it as soon as you remember unless it is almost time for the next dose. In that case, skip the missed dose and resume your usual dosing schedule. Do not double the dose to catch up. MEDICAL ALERT: Your seizure condition can cause complications in a medical emergency. For information about enrolling in MedicAlert, call 1-800-854-1166 (US) or 1-800-668-1507 (Canada).